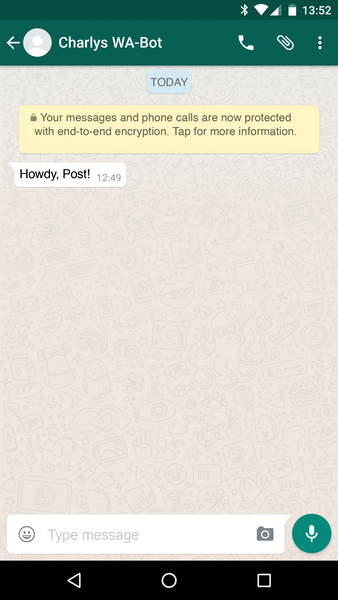 Yowsup makes the WhatsApp API believe it is running on cellphone. You need a SIM card that is not yet registered with WhatsApp for the login process. I used a free prepaid card for that purpose. "Free" here means that there is no monthly base charge or contract but only pay-per-call. Some mobile service providers have such SIM cards on offer. The output contains my login credentials in the style of Listing 1. The username is my telephone number including the country code, and the password appears in line 3. Now I can put the SIM card in a back drawer. From now on, I can send WhatsApp messages on my PC. ./yowsup-cli demos -l "491521234567:VQOHbVldOAjd+5GKIrHVWRNZkV0=" -s 491721234567 "Howdy, Post"
and receive them on my mobile phone (Figure 1). I have to go – my message just reached me: Strawberry harvest! Figure 1: A "Hello World!" sent by Charly to the phone.